This post can be considered to close a trilogy dedicated to summer cooking. There is non-cooking, almost non-cooking, and then there is get-out-of-jail-free-card cooking. By which I mean, tin opener cooking, or twist of the wrist cooking, which is, in fact, not doing anything cooking. Dolce far niente. The stuff in your store cupboard. The special stuff that you buy on holiday or in that cute, expensive deli, and then don't use because it's, you know, special. And you like the look of those labels, sitting so prettily next to the rice and the garbanzos, and like to think they make your larder look like Elizabeth David's. This is the time to go for them. Toast bread, slice tomatoes, open tin, and there you are, dinner. I now have a box that is super extra special and that I really am rationing like a castaway. It came all the way from Sicily, from Fabrizia Lanza (you know her from this earlier post, and this one, and this one), and is chock full of gorgeous stuff. Dried tomatoes, tomato sauce, tomato paste, dried herbs, tangerine jam, all done with produce from the kitchen garden at the school. I did the drawings on the labels, so there's an element of shameless self promotion, but not much. This, like the best Italian cooking, is all about the ingredients. I could only wish that it was still hot enough to warrant that kind of lazy cooking. I fear Scotland may be lapsing into its usual weather. Hearty soups are only around the corner. Sigh. 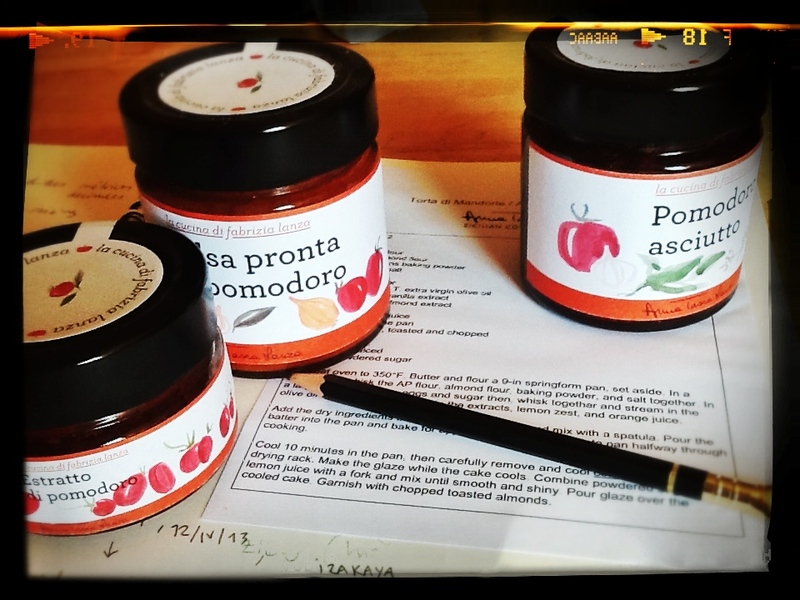 Let's have some of that Sicilian sunshine in a jar, then. Posted by lobstersquad at 4:19 p. m.
I've got "special jar envy"! Gorgeous designs by the way. From Sicily, and now this jar are far away from home.